Gwen Stefani's career spans decades, but this week, she hit a milestone even she didn't know was possible: kicking off a residency in Las Vegas. The singer's show, "Gwen Stefani - Just a Girl," in which she performs her biggest hits including "Hollaback Girl" and "Sweet Escape," began last night at Planet Hollywood Resort & Casino and will continue through March. In an interview with "Good Morning America," the three-time Grammy Award winner admitted that it's easy for her to forget how much she loves performing live until she takes the stage again. "I don’t miss it at all. I'm so good to do my kids and do mom and hang out with my cute Blakey and all that but then when I get up there I realize it's in there still and I'm like, 'OK, I need this attention still. I like it,'" she said with a laugh. "So, it's always been there. It's whatever the gift that God gave me and I feel so grateful and I feel so humbled and honored to be in Vegas. To do a show like this, it's just another level and it's challenging in another way." Gwen Stefani kicked off her Las Vegas residency on June 27, 2018. Stefani, 48, assembled a show replete with personal touches, including home videos and photos that her father took throughout her childhood. The idea she said, was to let fans in on both the ups and the downs of her life -- with the present, she gushed, being a "really amazing place." One reason? Her two-year long relationship with her boyfriend, country singer Blake Shelton. "He's my homeboy. He's my homey. He's just really an amazing all-around human so I feel so grateful for that," she said. "I celebrate him in the show! He's inspired me so much. He's changed my life." 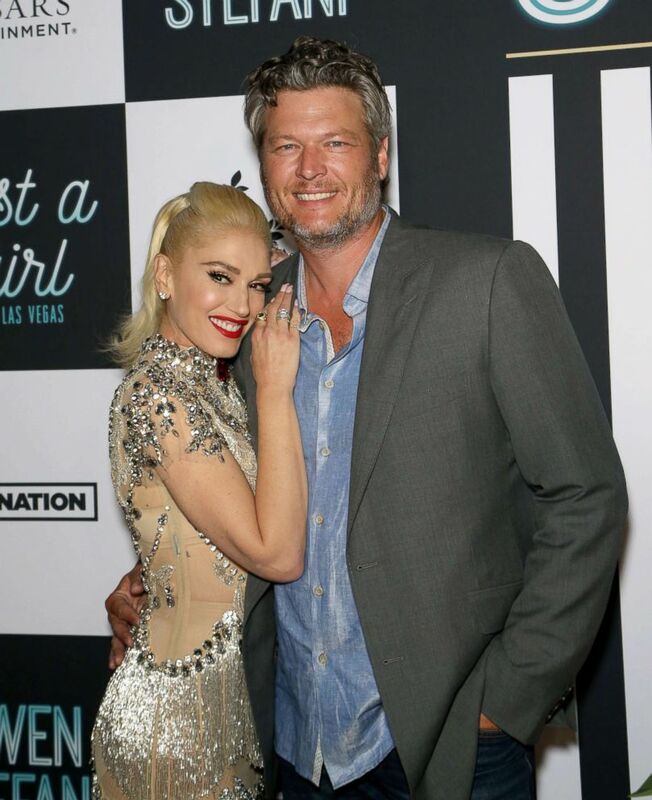 Gwen Stefani and Blake Shelton attend the grand opening of the "Gwen Stefani - Just a Girl" residency at Planet Hollywood Resort & Casino, June 28, 2018, in Las Vegas. Being able to spend more time with the people she loves was another motivating factor for Stefani to say yes to her latest gig. A mother to three sons from her marriage to rocker Gavin Rossdale, Stefani said that like many parents, she struggles with the idea of "how much [I] want to indulge [my] own life." However, her boys Kingston, 12, Zuma, 9, and Apollo, 4, will all be able to be in Las Vegas with her this summer. Whether they care about her show, however, is another matter. "Kids don't want to know about that!" she insisted. "They want you to be their mom, so that's what I do. I did get a text from Kingston before I went on stage. I was shocked! And it was like, 'Mommy break a leg, I love you.'" Surprises, however, are one thing she's very open to these days. When asked what's next for her, both personally and professionally, Stefani wasn't sure. However, from where she's standing now, that doesn't seem to matter. "I'm really grateful for every moment that passes," she said. "All I know is that I have a lot to look forward to."